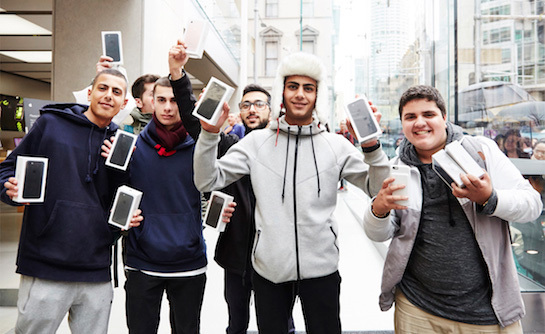 Five students from Sydney, Australia, namely Bishoy Behman, Mazen Kourouche, Marcus Barsoum, Matthew Alvarez, and Paul Behman, were the first customers in the world to walk out of an Apple retail store with an all-new iPhone today, although without the specific model they had been hoping for. The students had been taking turns waiting since Wednesday morning local time for the chance to purchase an iPhone 7 Plus in Jet Black, but Apple later announced that no iPhone 7 Plus models in any color, or iPhone 7 models in Jet Black, will be available on launch day for walk-in customers. The students were disappointed, but ultimately walked away with two iPhone 7 models each and $100 Apple gift cards provided by the store. Some customers who lined up elsewhere were provided with Apple gift cards of lesser value, but others received nothing, suggesting it was not a companywide initiative. Despite rainy and windy conditions, and the lack of iPhone 7 Plus availability, the video below shows that hundreds of customers still showed up at the flagship Apple Sydney location for the launch today. Just a few hours earlier, the first iPhone 7 and iPhone 7 Plus pre-order deliveries began in New Zealand, and orders are now beginning in China, Hong Kong, Japan, and Singapore. The first-wave launch will continue through to Alaska and Hawaii as the date reaches September 16 across the world. Apple has not indicated when stores will receive more iPhone 7 and iPhone 7 Plus shipments, but in-store reservations will resume on September 17 at 8:00 a.m. local time in the U.S., Australia, Canada, and Hong Kong, and on September 17 at 6:00 a.m. local time in Belgium, Germany, the Netherlands, Switzerland, and the U.K. So they didn't get the model they wanted, and YET they "ultimately walked away with two iPhone 7 models each." In other words, they were a bunch of scalpers. So they didn't get the phone they really wanted? Seems like a waste of time other then 15 seconds of fame. Apple really dropped the ball if they can't even get the Plus out on time. Don't get why people still camp out at the store when they can order it online. Or geez wait a couple of weeks and get the one you want without any shortage issues. It's embarrassing to launch a product and not have any stock. I guess the public didn't get the message that this is just an "iterative" iPhone upgrade and that they should wait till next year for the REALLY good iPhone.